Undoubtedly, the centre point of Canberra is the new Parliament House. All roads, paths, parks and even the lake seem to lead to it, point to it, highlight it or underscore it. There is truly, no missing it. It’s a striking building, by anyone’s standards – a sprawling white stone mass, semi-submerged in a rolling green lawn with great, gleaming metal flagpole at its apex. Parliament was not in session at the time of our tour, so the place was ours to explore and enjoy. 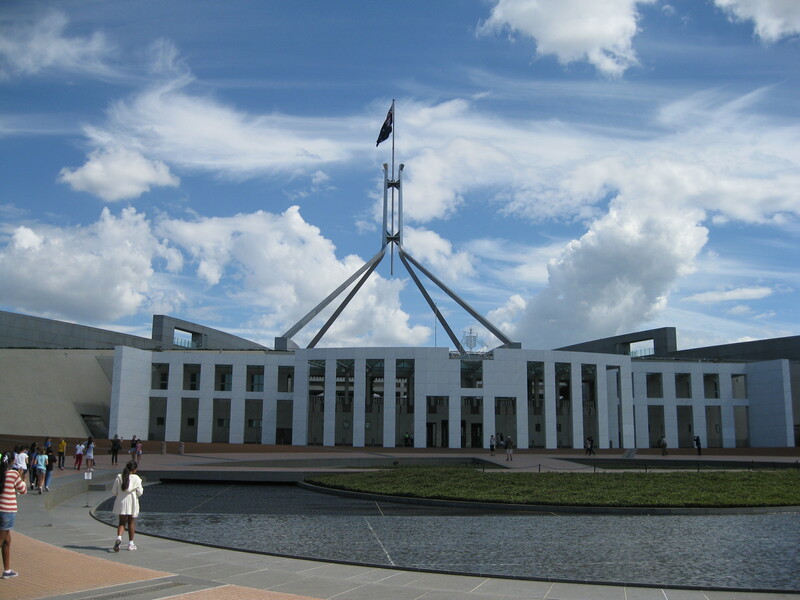 Our wonderful Education Officer/ Guide made certain that we didn’t miss anything and that we felt truly at home there, stressing that the New Parliament Building and indeed, the whole of Canberra, belongs to all Australians. We began our inspection of our new Parliament House in the Great Hall, where we stood in silent admiration of the beautiful and enormous tapestry that fills the far wall. Then followed a long, long walk through narrow corridors running north, south, east and west, past closed doors and past portraits of familiar political faces past and present. Occasional banks of windows gave glimpses of quiet green courtyards below. We crammed into a lift and burst out onto the roof under the flagpole. It rose above us like a giant tripod, its pointed end lost in wisps of cloud. From here the roof-top lawn seems made for roly-poly but better games await us in the chambers below. In the House of Representatives, my 30 twelve-year-old travelling companions dress up and enact a parliamentary debate “Should ads be shown during kids TV programmes?” They follow the protocols of parliament really well and they read their scripted lines with conviction. They put an end to advertising during kids TV shows. But the truth is they’re far too polite, well-behaved and downright decent to be convincing as Australian Members of Parliament! for? you made running a blog look simple. The total look of your website is fantastic, not to mention the content material! Sounds interesting! Can you send me link to your blog, please? Spot on with this write-up, I really feel this web site needs a great deal more attention. I’ll probably be returning to read through more, thanks for the info!